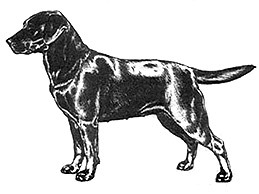 Physical features and mental characteristics should denote a dog bred to perform as an efficient retriever of game with a stable temperament suitable for a variety of pursuits beyond the hunting environment. Labs are loving, people oriented dogs. They are happiest when they are with you. Labs are retrievers and will bring you things they find lying about your house and yard. They tend to be quite patient with children and wonderful family dogs. They are not guard dogs. They may bark protectively but will generally not act more aggressively. Labs are wonderful people dogs more likely to lick someone to death than hurt them. They tend to be stable, not easily upset by strange things or occurrences. They will take many things in their stride. The multipurpose abilities of the Labrador, indicated by their use as guide dogs, drug detector dogs, bomb detector dogs etc is the best indication of their superior stability of temperament and train ability, which of course makes them the most popular family pet. Distinctive feature, very thick towards base, gradually tapering towards tip, medium length, free from feathering, but clothed thickly all round with short, thick, dense coat, thus giving ’rounded’ appearance described as ‘Otter’ tail. May be carried gaily but should not curl over back.